Posted By Dolores on March 31st, 2010 at 9:02 am | 308 comments. Yet another patient called me today to say that her doctor wants to order an MRI, but her insurer will not cover the cost, calling MRIs experimental for the purpose of breast cancer detection. I would welcome comments and advice from either side of this discussion. Posted By Dolores on March 30th, 2010 at 9:44 am | 134 comments. In an attempt to keep those in a similar situation up to date, I have a happy ending to the patient who is on Medicaid, Part D who was in the application process for help from the pharmaceutical company’s Patient Assistance Program. I’m happy to report that the breast cancer patient I wrote about earlier is now on a Patient Assistance Program (PAP) and has received her first free refill of Xeloda, an oral chemotherapy prescription drug. PAPs are sponsored by pharmaceutical companies and provide free or discounted meds to patients. If you or someone you know has been recently diagnosed with breast cancer, please contact the PBCC if there is anything we can do to help. This is why we’re here. Posted By admin on March 29th, 2010 at 11:04 am | 94 comments. 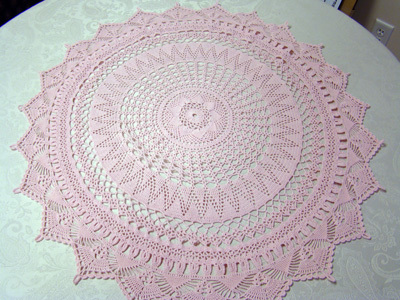 Today a lady from Ephrata walked into our office with a beautiful, handmade, crocheted doily that she has just completed. It’s 30” in diameter, pink and very intricate. Her name is Pat King and a year ago she brought us a beautiful handmade bedspread. She seems to be inspired to make these items on the event of her annual mammogram. What an awesome idea! We will use this as an auction item at an upcoming event and turn it into a cash donation, and someone will get a lovingly made item. Thank you Pat. Pat said she loves to do this and it took her about 3 weeks. Posted By Dolores on March 26th, 2010 at 1:32 pm | 103 comments. A few weeks ago, I wrote about a patient on Medicaid, Part D. The co-pay for her prescription is way beyond her monthly budget ($300 every 3 weeks). Currently, she is in the application process for help from the pharmaceutical company’s Patient Assistance Program. We have recommended that she contact the Patient Advocate Foundation for help through their Co-Pay Relief program. Posted By PA Breast Cancer Coalition on March 26th, 2010 at 11:54 am | 110 comments. We say it all the time, that one person really can make a difference. But this week, Freda Brown at Johnson Controls in York proved it! 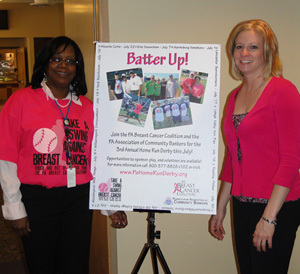 She organized a “Go Pink” day to raise money for two teams of hitters at this year’s Home Run Derby. Heather and I were there for the kick-off…pink balloons, pink food, pink lemonade, pink shirts, pink roses! We set up our traveling road show, as we like to call it, to raise interest among employees and funds. For two hours, Freda spoke to each person who walked by (there was no escaping her! ), explaining what we were doing there, encouraging them to buy a shirt or make a donation, and try to win the beautiful rose bouquet. Her ability to talk to people and get them to open their wallets with a smile was astounding. I heard many people say, “OK, because it’s you asking, Freda!” Remarkably, she was able to collect over $550 in two hours, with very little effort! And it struck me how easily her method might translate to any other large company looking to raise funds for a Home Run Derby team. If you are someone like Freda, someone who “could sell screen doors in a submarine”, then why not try this at your job? We’d be happy to come to your place of employment and help you sell shirts and collect donations. In just a few hours, you might easily be able to raise the $500 fee for a Home Run Derby team! Then you could organize a cheering section and cheer on your team’s hitters in July! Thank you, Freda! You proved to me this week that one person really can make a difference. Posted By admin on March 10th, 2010 at 3:27 pm | 0 comments. The PBCC hears from many women each week who are newly diagnosed with breast cancer. Recently, I took a call from a mother whose 15 year old daughter was diagnosed with breast cancer. 15! I spoke to her for over 20 minutes in awe. She seemed to have everything in order: doctor’s appointments, courses of treatment, breast cancer statistics, etc. She even spoke of her daughter’s “pediatric breast oncologist” – those are three words you don’t hear together every day! We will send her daughter one of our Friends Like Me care packages filled with lots of information and soft touches – I only wish we had more to provide her about teenage diagnosis. Thankfully, this is not something we hear of everyday. I hope that by talking and listening to their story I was able to help in some way. If you or a loved one are diagnosed with breast cancer, please feel free to call us at 800-377-8828 – we’re happy to help in any way we can! Posted By Dolores on March 1st, 2010 at 3:34 pm | 1229 comments. Patient advocacy is of course incredibly rewarding. Referring a woman, newly diagnosed with breast cancer, to just the right program or organization to help with her particular circumstance makes for an amazing day at work. At the moment, we are faced with finding resources for two women who share the same problem: Medicare does not cover all the costs of their treatment or medication and they cannot afford the supplemental coverage. One of those women has actually stopped treatment. Is this a coincidence? Or is it, as a breast center nurse called it, a new trend of “Medicare poor” or “retired poor”? The PBCC will not give up until we find a resolution for these women, but meanwhile we worry about that regimen of chemotherapy being interrupted and what it will do to her. And we worry about the other patients these two women may represent … the ones with the same problem who aren’t calling because they have already given up. Posted By PA Breast Cancer Coalition on March 1st, 2010 at 3:19 pm | 103 comments. I realize that October seems a long way off, but here in the PBCC office, we are already hard at work planning the 2010 Annual Conference! 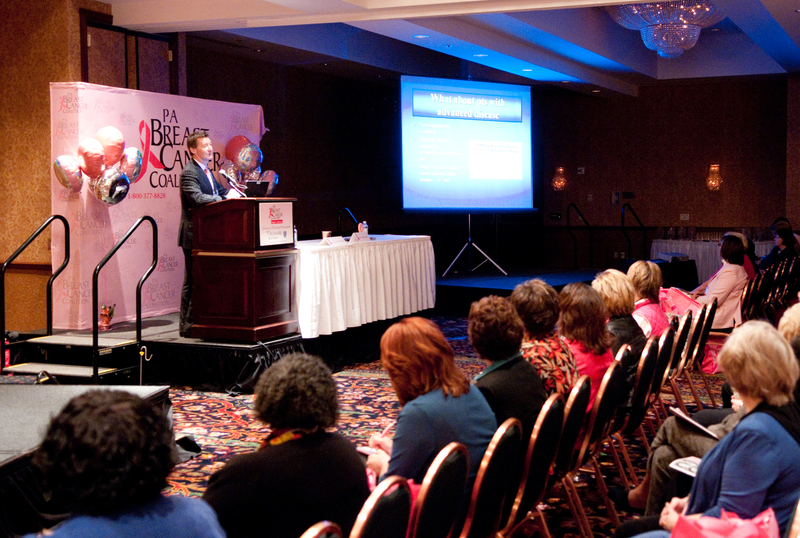 This year’s conference will be held on Wednesday, October 13th at the Harrisburg Hilton. Of course, you’re not limited to these tracks; they are simply suggestions. The sky is the limit so be creative! Workshops are one hour long. The deadline for proposals is Friday, March 12th at 4pm. Head to the PBCC Annual Conference website for more details about what your proposal should include and other important information! One last important note. Please make sure that the suggested presenter is available to present at our conference on October 13, 2010, before you submit your proposal. The PBCC applies for continuing education credits for the workshops and cannot replace presenters once workshops are confirmed. Thanks for your input and we look forward to reading your proposals!